1959: Hedy Lamarr writes to Franz Kline. 1959: The Museum of Modern Art becomes the first American museum to own a work by Barnett Newman. 1959: Thomas B. Hess publishes a monograph on Willem de Kooning published by Braziller in New York. January 10, 1959: Franz Kline buys a house. March 1959: "Barnett Newman: A Selection 1946 - 1952" opens at French and Company. Clement Greenberg wrote the text for the catalogue published in French and English. May 16, 1959: Mark Rothko changes his legal name from Marcus Rothkowitz to Mark Rothko. May 28-September 8, 1959: "The New American Painting as shown in 8 European Countries 1958-1959" exhibition at The Museum of Modern Art. Except for two versions of de Kooning's horrendous Woman and suggestions in one or two of Gorky's canvases, the paintings are essentially non-figurative. Most of them are quite large. Reproductions in black and white are inadequate for acquaintance except in such simplified statements as the overpowering scaffoldings of Franz Kline, for color is of the essence of the work, as in Brooks' lyrical curvilinear floating shapes or the best swirling and interlacing organizations by Pollack [sic]. Despite landscape suggestion as a source of inspiration, as in certain paintings by de Kooning, Guston and Stamos, the exact urgency which called forth the particular statement is in various degrees enigmatic. And preoccupation with the new techniques for their own sake is another danger for artists. The roots of this work are many - rebellion against photographic and illustrative realism; dismay at the picture that expanding science presents; the sweeping revision of our viewpoints through post-Freudian psychology; the renewed influence of the old orient; and as that discerning French critic Andre Chastel pointed out, elements of such European forerunners as fauvism, German Expressionism, Klee, Picasso, Matisse and perhaps Masson's surrealism... On the other hand to Zen Buddhism has been attributed notable influence, although one artist thus singled out had to make a hasty trip to the library to find out what Zen is about. Should both Mell and Rothko die, Herbert and Ilse Ferber were to serve as their executors and Kate's guardian, with the Reises named as alternates. If Kate died at the same time as her parents, Rothko's estate was to be distributed in seven equal shares among his two brothers, his sister, Mell's two sisters, Ferber and Stanley Kunitz. On June 11, 1959, Rothko specified how his paintings should be distributed in a letter to the Ferbers and Reis. Rothko had been working on the murals for about eight months prior to the trip. On the boat to Europe he met John Fischer, who was then the editor of Harper's magazine. Later, in 1970, Fisher recalled that Rothko compared the Seagram Murals to Michelangelo's Laurentian Library. Rothko had visited Florence during his last trip to Europe in 1950. During their first month in Europe the Rothkos traveled from Naples (visiting Pompeii) to Rome, then to Tarquinia (for the Etruscan murals), followed by Florence (viewing the Fra Angelico frescos and visiting Michelangelo's Laurentian Library aka the Medici Library). June 23, 1959: Willem de Kooning buys 4.2 acres of land in the Springs. De Kooning had previously visited Italy in 1958 during a European trip with Ruth Kligman. Kligman had remained in Europe when de Kooning returned to New York. In July 1959 de Kooning went back to Italy. August 1959: Barnett Newman travels to Canada to head summer art workshop. c. September 1959: Joan Ward moves to San Francisco, taking her and Willem de Kooning's daughter with her. September 24, 1959: Wolfgang Paalen commits suicide in Mexico. October 4,6,7,8, 9, 16, 1959: Allan Kaprow's 18 Happenings in Six Parts takes place at the Reuben Gallery in New York. Kaprow's Happenings had its antecedents in Dada performances of early twentieth century and John Cage's interdisciplinary performances during the early 1950s. Kaprow studied under Cage at the New School in New York from 1956 to 1958. Cage's 1952 performance event included Cage reading a lecture on Meister Eckhart, David Tudor playing the piano, Robert Rauschenberg operating a hand-wound phonograph and Merce Cunningham doing an improvised dance around the audience. Other participants planted in the audience stood up at various intervals and said a line of two of dialogue. (HA31-2) Kaprow's first experiment with a performance event took place in 1958 at a picnic for Hansa Gallery artists. Kaprow was reticent to speak of his performance events as "Happenings" - a term which was embraced by the pop culture of the 1960s and used as the title for a 1970 film and a song by The Supremes. Life magazine did a two part article on the "new" art. The first part appeared in the November 9th issue ("Baffling U.S. Art: What It Is About") and was mostly about Jackson Pollock. December 16, 1959 - February 17, 1960: "Sixteen Americans" at The Museum of Modern Art. The death blow to academic gesture painting was struck by Frank Stella, at age twenty-three, in the prestigious "16 Americans" show at The Museum of Modern Art at the end of 1959. The deadly stroke was a roomful of his abstractions composed of symmetrical, concentric configurations of black stripes... It was not only Frank's paintings that infuriated me, but also what he - and sympathetic writers said about them. While participating on a panel at a New York University in 1960, he remarked that he found few creative ideas in current art; there were not even any good gimmicks. He then said that it was enough for him to have an interesting idea; he would be happy if someone else, or a machine, made his pictures according to his specifications. What interested him most was the idea and not the process of painting. He couldn't understand why it was bad for an artist who had a good idea to just execute it or have someone else do it... I attended Frank's talk at NYU with Robert Goldwater, who was just as outraged as I was. When we left the lecture hall, he turned to me and said: "That man's not an artist. He's a juvenile delinquent." Stella's comments were not unlike the comments being made by Andy Warhol during the 1960s and 1970s. Just as Stella "would be happy if someone else, or a machine, made his pictures," Warhol wanted to be a "machine" and would, at one point, claim that one of his superstars, Brigid Berlin painted his paintings. Like Stella Warhol was interested in "monotony for its own sake." He had filmed a stationary building in 1964 for more than six hours and when asked during a college appearance at Rutgers University on March 9, 1966 about his intentions in regard to his films, he was quoted as saying, " “If they can take it for ten minutes, then we play it for fifteen... That’s our policy. Always leave them wanting less," similar to Stella's paraphrase of John Cage to Sandler, "if something looks boring after two minutes, look at it for four..."
c. Late 1959/early 1960: Mark Rothko backs out of the Seagram deal. Mark Rothko, through his dealer Sidney Janis, had agreed to paint mural-sized paintings for the Seagram building's Four Seasons restaurant on June 6, 1958. 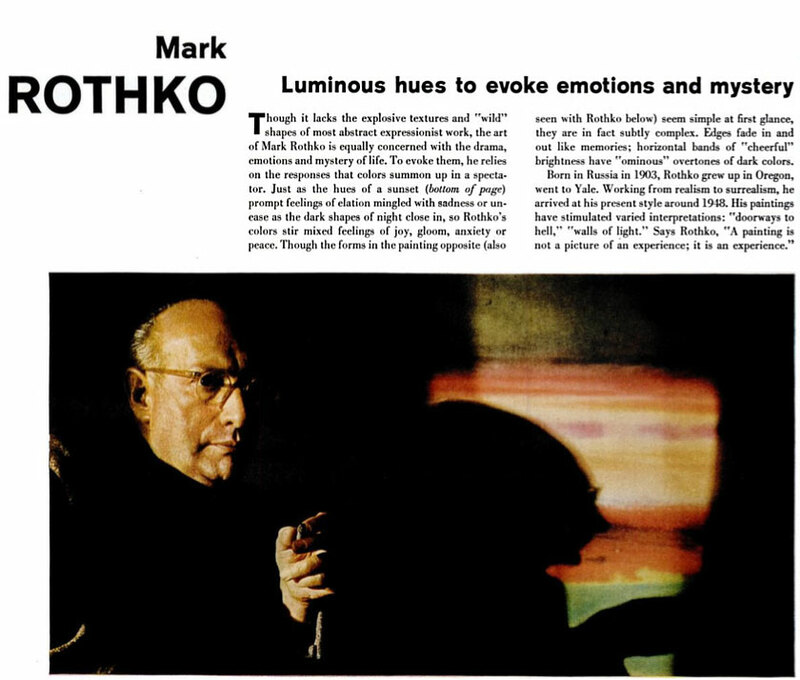 In July 1958, Rothko took on a new studio space large enough to paint the murals in. During June 1959 Rothko had commented to a fellow passenger on a ship he took to Naples for a summer break in Europe, that he had accepted the mural project "with strictly malicious intentions" and wanted to make the diners feel "trapped." The restaurant opened in c. late July 1959. After visiting it in late 1959/early 1960 Rothko backed out of the project even though he had already completed three sets of panels.